Ancient Bronzes of the Asian Grasslands from the Arthur M. Sackler Foundation presents for the first time a major sampling of steppe art from the renowned collections of the late Arthur M. Sackler, M.D. The exhibition brings to life the complex cultures that flourished across the Asian grasslands from northern China and Mongolia into Eastern Europe during the late second and first millennia BCE. Illuminating how these societies influenced, and were influenced by, the culture of dynastic China, the exhibition illustrates the important role of the steppe peoples in facilitating trade and travel along the Silk Route across Asia. Curated by Trudy S. Kawami, Ph.D., Director of Research for the Arthur M. Sackler Foundation, the exhibition presents eighty five works illustrating the personal decorations and equipment of the horse-riding steppe dwellers of the late second and first millennia BCE. The bronze belt buckles, plaques, and weapons of these ancient horsemen are ornate, technically sophisticated, and richly patterned. Animal motifs including antlered stags, wild boars, and birds of prey are a primary theme. The exhibition reveals how these steppe cultures used the animal world as a source of symbols to indicate tribe, social rank, and connection to the spirit world. The Eurasian grasslands, also known as the steppes, cover a region extending from northern China westward through Mongolia to the plains of Eastern Europe. This exhibition focuses on the eastern or Asian steppes whose rolling grassy plains are punctuated by snow-topped mountain ranges like the Tien Shan (Heavenly Mountains), and deserts like the Gobi, and the Taklamakan. The eastern steppes were home to a remarkable culture, whose art, richly decorated with animal motifs, is only now beginning to be understood by scholars. The bronze ornaments, weapons, tools, and vessels presented in this exhibition, provide a glimpse into the lives of the ancient peoples of the steppes including their work, dress, spiritual beliefs, and social structure. The steppe dwellers made art objects that were easy to carry, pack, or wear because of their mobile lifestyle. They favored bronze for its strength, light weight, and resilience, and used it to make tools, weapons, vessels, and ornaments to decorate their clothing. Steppe artisans made small bronze plaques and roundels in abstracted animal and bird forms. 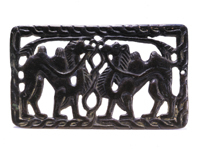 Decorative one- and two-piece bronze buckles were another important steppe artifact. The horses that carried the steppe dwellers in life, and were often buried with them in death, were also decorated with bronze ornaments. Bronze is the best-documented artistic medium, but remains of wool and silk textiles, felt appliqués, wooden cups, leather bags, and birch bark containers have also been excavated at archaeological sites. The exhibition is organized by the Arthur M. Sackler Foundation, New York. Arthur M. Sackler, M.D. (1913-1987), a research psychiatrist, medical publisher, connoisseur, and collector of art, established the Arthur M. Sackler Foundation in 1965 to make his extensive art collections accessible to the public. The Foundation collection has more than 1,100 works of art including Chinese ritual bronzes and ceramics, Buddhist stone sculpture, and the renowned Chu Silk Manuscript, the oldest existing Chinese written document. Funded in part by FMC and the National Advisory Board of the UW Art Museum.